It’s been awhile since I blogged and I figured that I would share what I’ve been up to, Yes, I have been busy and no, it’s not paintings. I’ll be sharing a serious of posts under my kissing dirt category just to show what I have been doing. Well, as we all know it’s summer and I have a great passion for plants and gardening, I think it all started when I was just 5 or 6 years old, I would get some dry beans from my mom’s pantry and scoop some dirt from the backyard into to a Styrofoam cup, buried a bean in each cup with the dirt and placed the cup on a sunny window sill. I would pamper those little cups every day, checking the moisture in the soil and adding water as needed, I would also rotate the cups to make sure they would be getting enough sun. I would do these until finally, that amazing miracle would happen, that’s what I thought anyway, a little seedling would burst through the soil and I would have my little plant. I never knew what to do after once I had the plant a few inches high so it would end up dying but it was okay, I would do it all over again. I was obsessed with the idea that a dry bean would become a plant. Later, I started planting avocado seeds and any seed I could get my hands on, never had a garden to transplant them outdoors, not because we did not have the land, just because my father (who I love to death) would not let me plant the seedlings in the garden beds because my mom and him had this perfect manicured law that they were obsessed with, they both wanted a simple clean well-manicured lawn with minimal garden beds. I guess this is where I get my crazy garden bed ideas and the need to constantly plant everything that I start from seeds, and boy I am always planting seeds. So, this is how it all got started this spring I had to organize all my seeds, especially since I was going to buy some more as if I didn’t have enough seeds. 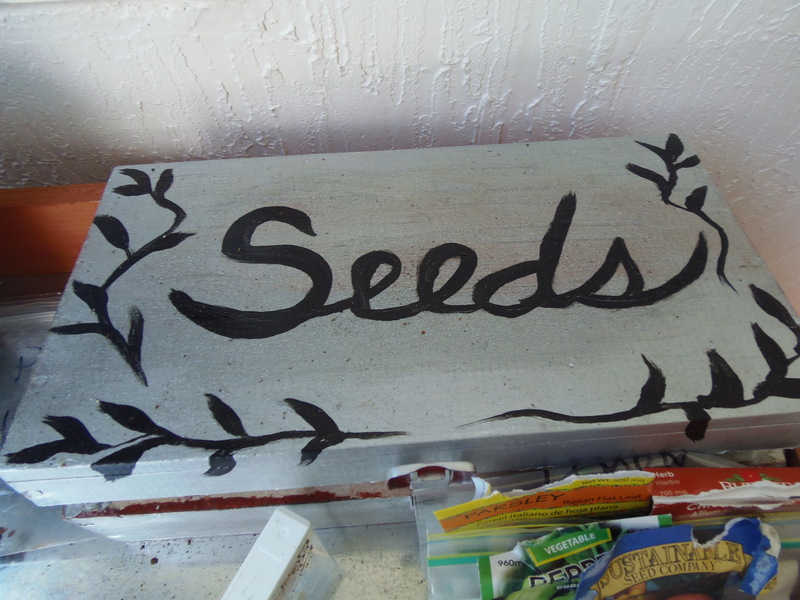 I always had a seed box, just an old wooden wine storage box that I had up cycled, originally painted red, and painted the woods seeds on it. Well, I got annoyed with the red and all the gazillion sandwich zip bags with seeds inside them and decided to paint it silver (left over color from another project), nothing fancy, very rustic and painted “seeds” on top just in case I did know what was inside, lol, jk. 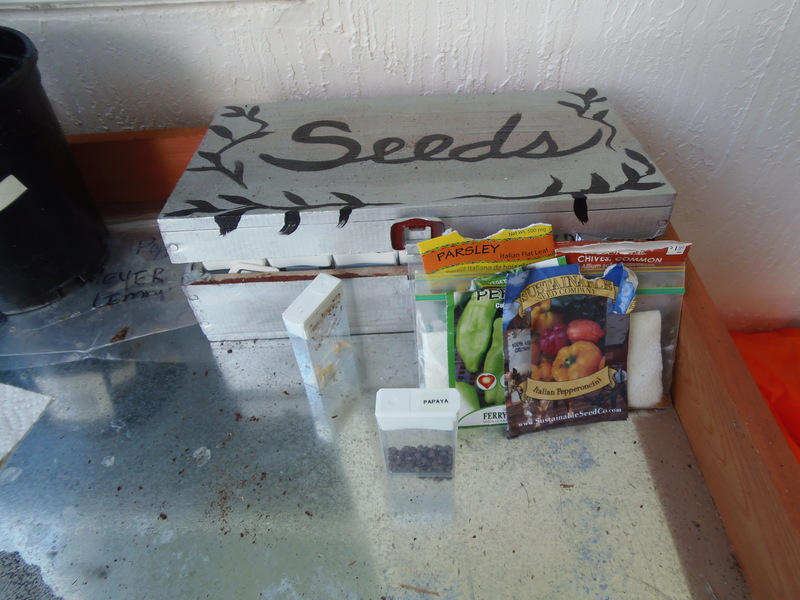 Then, the issue with all the seeds, I needed a container to get them out of the packets and sandwich bags, after searching for ideas I ran into the a how to use a tic tac container multiple ways online and I loved the idea. 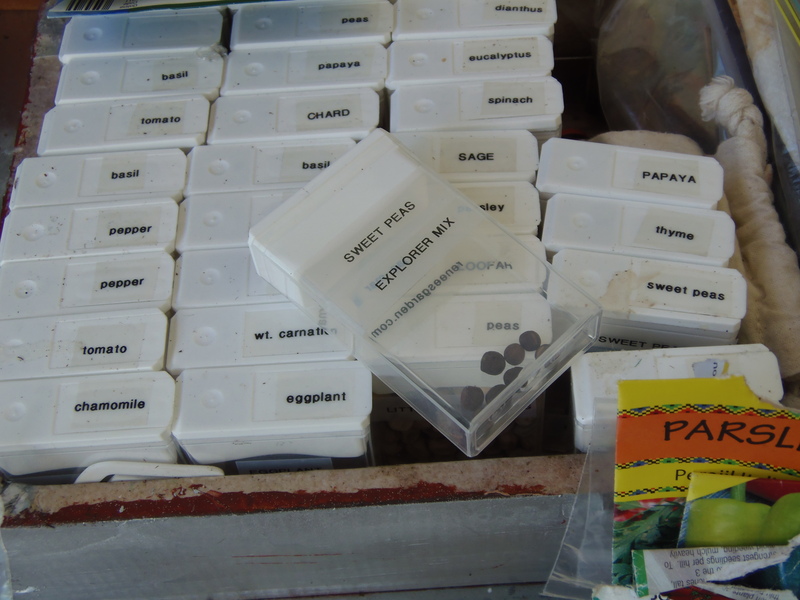 I just needed tic tac containers this is where my kids came in handy everything I would go to the grocery store they would get 2 packs each (4 containers a visit- not too shabby, lol) they got their treat and I got my seed containers, what a deal. 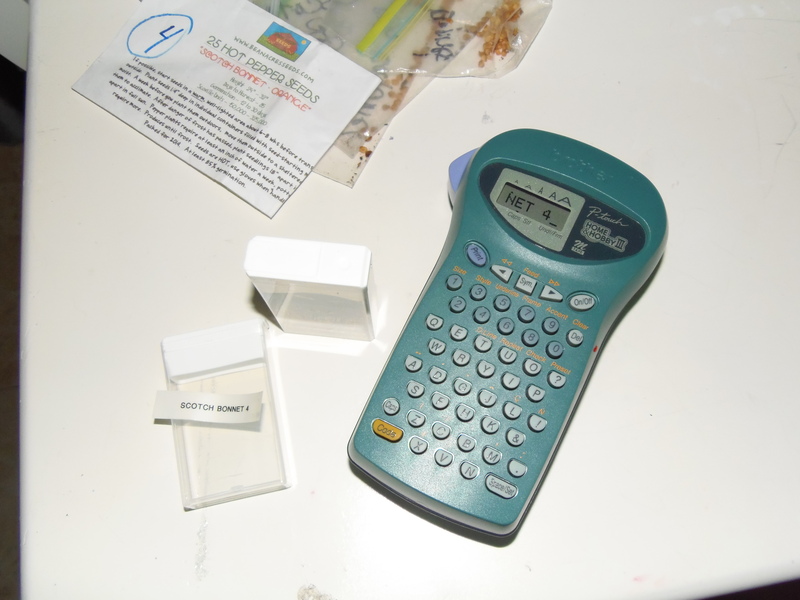 I used my trusty P-Touch label maker and voila, perfect seed containers that fit in the box. 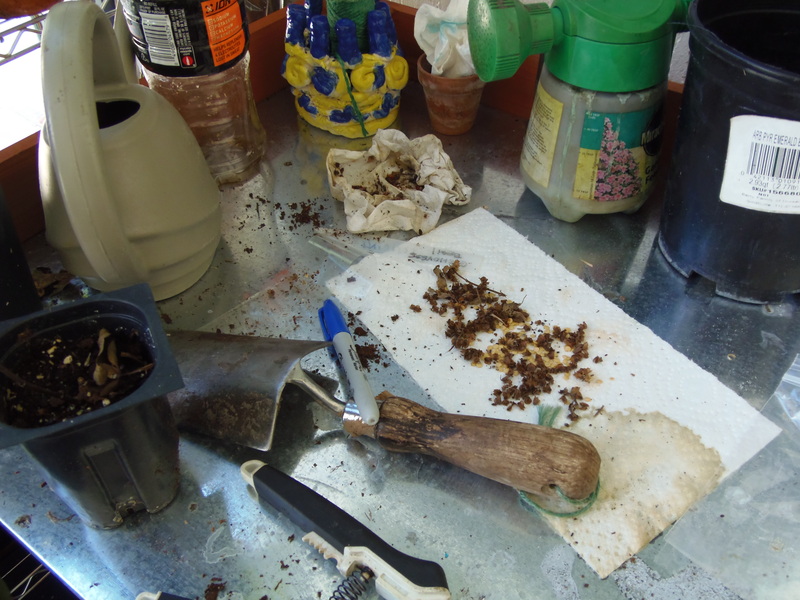 Now I just have to sort this mess….New seeds from the plants that have seeded.